April 15th is about three weeks away. To some, that may not mean much. But if you haven't yet filed your income tax returns, the clock is ticking. Louder. There's no need to push the panic button, though. In fact, if you wait until Sunday, a team of tax experts can answer your questions - or maybe give help you didn't even know you needed. Members of the Rhode Island Society of Certified Public Accountants present Tax Forum 2010 on Sunday, March 28, from 2 to 4 PM. CPAs from several firms, as well as officials from the RI Division of Taxation and the IRS, will discuss changes to tax law, explain current tax credit programs and required documentation, and offer tips for preparing forms. Every year since 1978, members of the RISCPA have hosted Tax Forum. Again this year, the program will broadcast live from Rhode Island PBS studios in Providence. While one group of tax professionals is talking to you on camera, another group of CPAs is behind the scenes answering your tax preparation questions on our phone bank. Tune in for free help. The April 1st episode of A Lively Experiment will be "The Reunion," featuring members of the original panel of A Lively Experiment. Watch the 3/18 Episode of WSBE's "A Lively Experiment"
PROVIDENCE, RHODE ISLAND (March 19, 2010) – WSBE Rhode Island PBS today launched its first YouTube episode of A Lively Experiment. The show, taped on March 11, has been converted and split into three segments, and is available on the Rhode Island PBS Channel on YouTube. Links will also be available each week on the station's blog, Bird on the Wire, and through the station's fan page on Facebook, and on Twitter. The move comes as a result of a growing demand from the audience to view the show online. "We get emails from 'snowbirds' in Florida and people who moved out of Rhode Island but who still have close ties," said Bob Fish, WSBE president. "We also get requests from viewers in the state who happened to miss the show that week. We're glad to finally be able to bring this added service to our loyal 'Lively' viewers – and to introduce the show to a whole new audience online," Fish added. The premiere online episode features Ron St. Pierre, 630 WPRO-AM radio host as the moderator. Panelists on March 11 were former Cranston Mayor Steve Laffey; Jim Hummel, investigative journalist and executive director of the Hummel Report; former state representative and currently an attorney with RI Legal Services, Denise Aiken; and public relations consultant and former TV news director, Dave Layman. Fish said that, after a period of testing, the station plans to get each week's episode segments uploaded on Fridays, the day after the show is taped. A Lively Experiment premiered more than 20 years ago, in 1987. Although the faces and sets have changed, the show still retains much of its original format: four guests and a moderator discuss the week's top issues in local politics and government. Topics which may not have made the headlines – but deserve public attention – are also introduced. A popular regular feature is the 'Outrage of the Week,' wherein each panelist names one incident that most caught his or her attention. For its first 17 years, A Lively Experiment's moderator was veteran radio talk show personality, Steve Kass. Steve Kass left the show in 2005 when he joined Governor Donald Carcieri's administration. Panelists have always included a combination of news reporters and news makers, analysts and opinion leaders, elected and appointed officials from all political ideologies. The show is produced each week by David Marseglia. WSBE Rhode Island PBS is owned and operated by the Rhode Island Public Telecommunications Authority, a quasi-public agency of the State of Rhode Island. Rhode Island PBS is a viewer-supported member of the Public Broadcasting Service. Committed to lifelong learning for more than 40 years, Rhode Island PBS uses the power of commercial-free media to educate, engage, enrich, inspire, and entertain viewers of all ages in Rhode Island, southeastern Massachusetts, and eastern Connecticut. For more information about the programs and education services at WSBE Rhode Island PBS, visit www.ripbs.org. The acclaimed London musical Imagine This comes to WSBE Rhode Island PBS on April 1 at 8 PM. The musical tells the story of a group of Jewish actors in the Warsaw Ghetto who struggle to keep alive the dream of freedom and the will to resist among the prisoners of the ghetto. The troupe performs the epic tale Masada, about a small band of courageous Jewish rebels who held at bay 10,000 Roman soldiers on the ancient Judean mountain 2,000 years ago. The play within the play sets up a powerful contrast between fantasy and reality. Although the Jewish Holocaust is an unlikely subject for a musical, Imagine This, in the tradition of Fiddler on the Roof, deals respectfully with its sobering subject matter through song and dance. Director Beth Trachtenberg consulted with Holocaust survivors, and incorporated some of their stories into the script. In researching the musical, I found it interesting that some London theater critics focused their negative reviews on the subject, rather than the merit or deficiency of technical and theatrical performances. On the other hand, audiences seem to love the show, offering high praise and reporting standing ovations at performances. You will have an opportunity to decide for yourself. Imagine This airs on WSBE Rhode Island PBS on Thursday, April 1 at 8 PM. Here the line-up for this week's show. After the corned beef and cabbage dinner, after the ice-cold tankard of brew (or maybe with it), put your feet up and tune in for an evening of Irish entertainment. At 7PM, The Music of Ireland: Welcome Home tells the definitive story of contemporary Irish music. 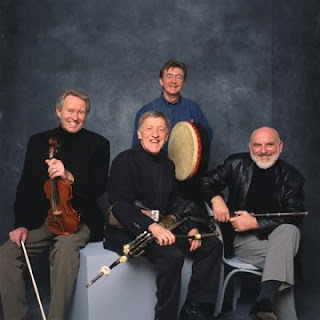 Hosted by Clannad’s Grammy Award-winning Moya Brennan, the documentary features exclusive interviews and performances by great icons of Irish popular culture including The Chieftains (pictured). At 8:30PM, enjoy When Irish Eyes Are Smiling: An Irish Parade of Stars. Pulitzer-prize winning author Malachy McCourt wrote and produced this warm and nostalgic parade of Irish favorites from the past. The archival program focuses on Ireland's most beloved ballads and folk songs, performed by some of the world's greatest vocalists. Among the traditional favorites to be featured are "Too Ra Loo Ra Loo Ra (An Irish Lullaby)," "Molly Malone," "McNamara's Band," "It's A Long Way To Tipperary," "Danny Boy" and "When Irish Eyes Are Smiling, " as well as such Emerald Isle-influenced classics as "Look To The Rainbow," "The Unicorn" and "A Great Day For The Irish." Finally, at 10PM, make the gentle transition out of traditional Irish music into songs sung by Irish performers by watching Celtic Thunder: It's Entertainment. This stylish and high energy trip through some of the great songs of the last 30 years is pure showbiz! 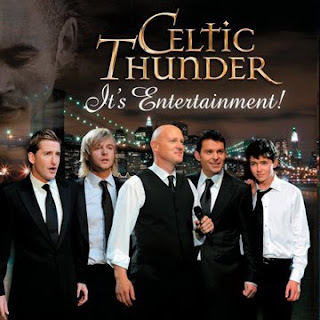 It is a tribute from Celtic Thunder to the legacy they have inherited from the great entertainers of the past, and a mark of how far they themselves have traveled as performers, in a few short years.It evokes an era of big bands and boulevards, top hats and tails and singing and dancin’ in the rain! It makes for irresistible listening as the principals from this generation pay their respects to the stars of an earlier time. In the true tradition of variety the music covers a mix of styles, of songs and of singers, as the lads salute their musical heroes- from Fred Astaire to Neil Diamond, from Jim Croce to Chicago, from Michael Buble to The Beach Boys. Hardly Irish ballads, true, but still delightful entertainment. Jimmy Sturr and His Orchestra - 'America's Best Polka Band' - will have your toes tapping right from the start! This special was taped at Caesar's Windsor Casino during Canada's Polkapalooza Festival in late 2009. Remember to support your local public television station (that's us, by the way). Your contribution makes it possible for us to present the shows you love... and shows you will love even if you don't know it yet. Discover more on Rhode Island PBS. Here the line-up for tonight's show. Get your "fix" on Saturday night: Red Green's "Duct Tape Forever"
Fans of The Red Green Show will want to put down their latest DIY project and make note of these two dates: Saturday, March 13, and Saturday, July 24. Possum Lodge is taken to court by big-shot executive Robert Stiles, after his limousine is damaged while parked at the Lodge. Red and the boys are ordered to pay a $10,000 fine within ten days - or lose their beloved Lodge. While considering several methods of raising the money, Harold suggests participating in the upcoming Duct Tape Festival in Minneapolis-St. Paul. There, a contest to create 'something' made of at least 50% duct tape, will garner the third prize winner exactly $10,000. Naturally, the boys band together and go for the bronze! Before long, a large Canadian goose covered entirely with duct tape is attached to the possum van, and Red and the boys set out on their quest to save the lodge. However, Mr. Stiles has an ulterior motive, and plans to stop Red from successfully paying the fine. Consequently, what begins as an enthusiastic road trip is soon plagued with mysterious obstacles that threaten to prevent the boys from ever making it to the competition. In addition, Red Green himself (Steve Smith) will check in with our studio hosts during the program to announce his one-man show, coming to Providence this summer. Fans will have a chance to reserve tickets to Red Green's live July 24th 'The Wit and Wisdom Tour' while watching Duct Tape Forever on Saturday night. 'The Wit and Wisdom Tour' covers Red's adventures in every day life, the great outdoors, and - most certainly - the latest and greatest use for the handyman's secret weapon, duct tape. The live performance is at 8 PM on Saturday, July 24, at the Veterans Memorial Auditorium in Providence. Red Green has more surprises planned for local fans, too. More details will be "unrolled" as we get closer to summer. Tickets to 'The Wit and Wisdom Tour' are available through WSBE Rhode Island PBS by calling (401) 222-3636 or ONLINE. Watch WSBE Rhode Island PBS free over the air on digital 36.1, or on paid television services: Cox, Verizon, and FullChannel cable channel 08; DirecTV 36; Dish Network 7776. Comcast subscribers in Massachusetts should check local listings for the channel number in your area.